This easy to make turkey shaped lollipops are a Thanksgiving treat sure to get gobbled up in no time. Today I have another super easy-to-make sucker recipe to share with you all. 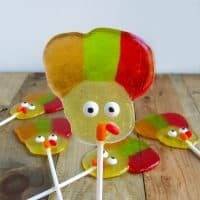 Since our Halloween Frankenstein Suckers where such a hit, I know you guys will love these cute Turkey Suckers. 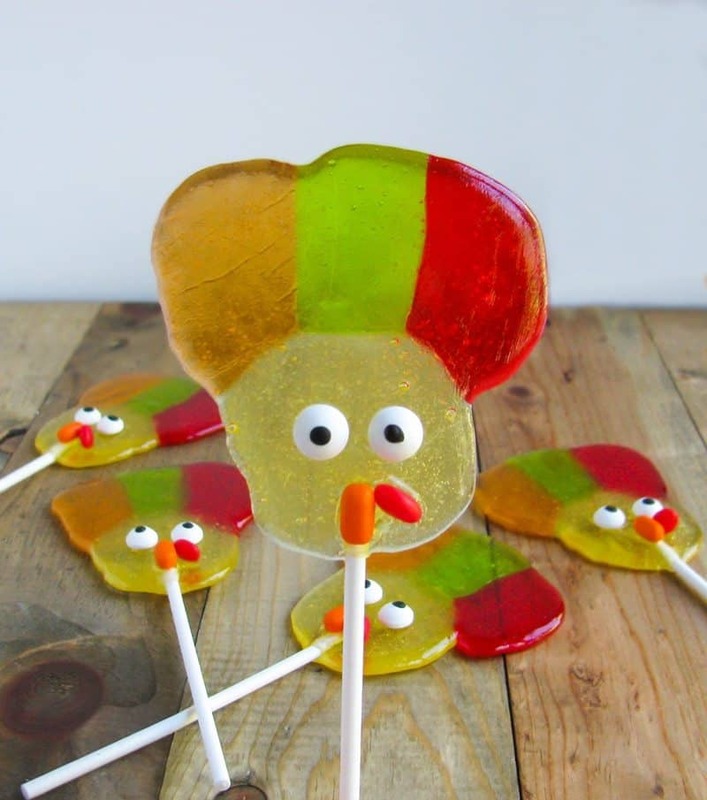 These adorably sweet turkey suckers are perfect for serving at your Thanksgiving party. Although they might look difficult to make, putting them together is, in fact, super simple. Check out the step-by-step instructions below. Putting together these turkey suckers is truly a simple process. 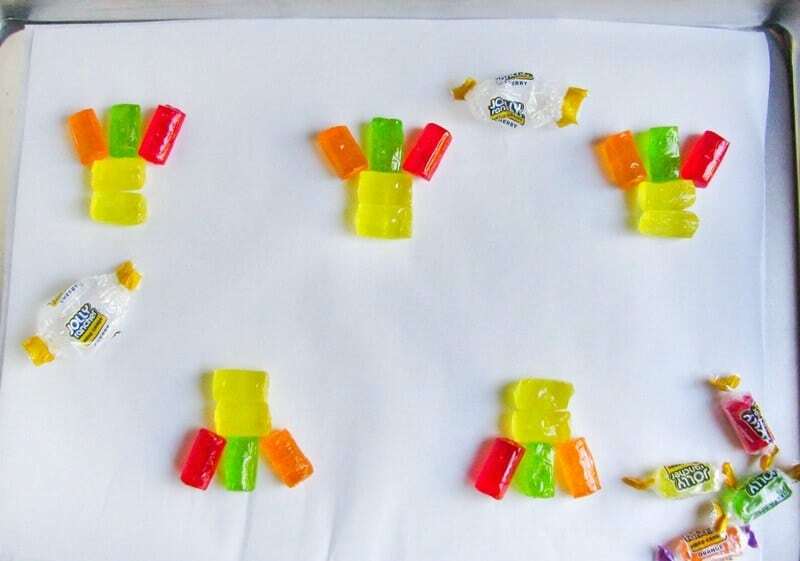 Start by sticking together 2 yellow Jolly Ranchers vertically, making sure that they are touching. Then take your red, orange and green jolly ranchers and stick them above the yellow ones in a fan motion. Also, be sure to leave enough space so that you will be able to place a lollipop stick in them later. Once you have all your Jolly Ranchers in place pop them into the oven until the Jolly Ranchers melt together (should take around 5-6 minutes). 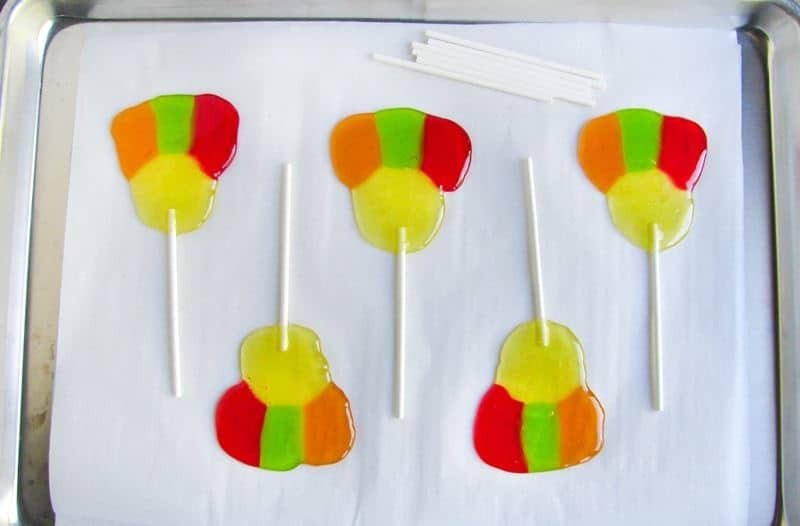 After removing from the oven immediately roll the end of a lollipop stick in each melted sucker towards the bottom. Quickly add the candy eyes, Tic-Tacs and Red Hots. If the suckers start to harden, grab a lighter. Carefully, hold the flame for a few seconds where you want the candies to go. The flame will melt the sucker just enough so that you can stick the candies on. Then, let them set at room temperature until they harden (about 10 minutes). Now, they are ready to serve. 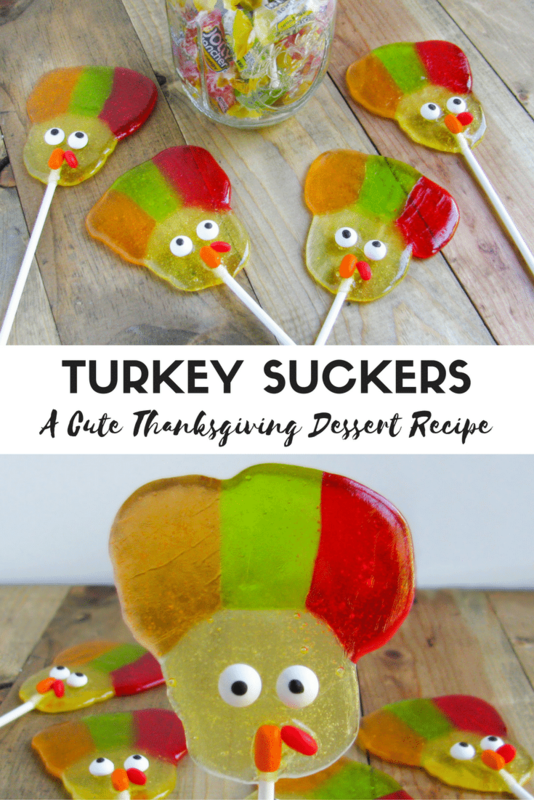 I hope you enjoyed this easy-to-make and super cute Thanksgiving dessert recipe. Have a fantastic Thanksgiving! Gobble Gobble! 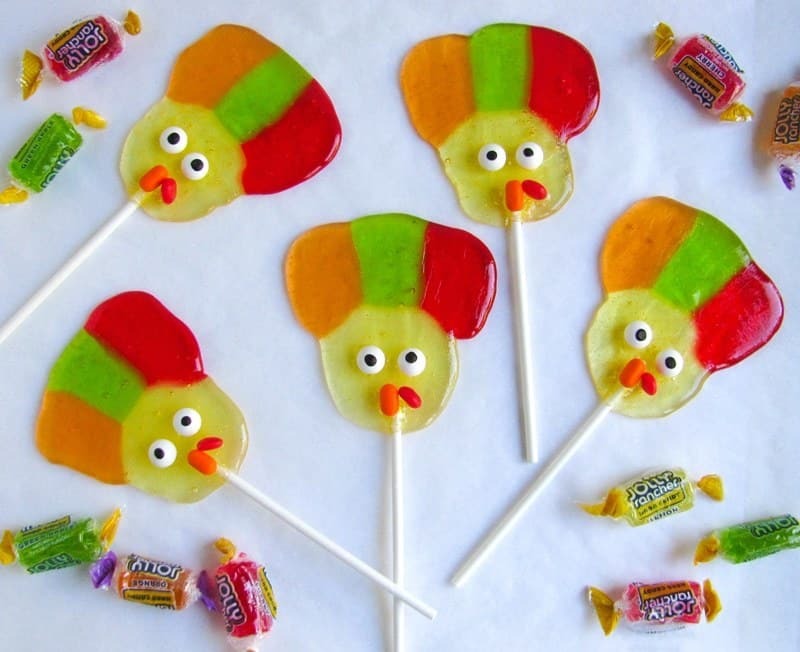 This easy to make turkey shaped lollipops are sure to get gobbled up in no time. Stick together 2 yellow jolly ranchers vertically, make sure they are touching. Then take your red, orange and green jolly ranchers and stick them above the yellow ones in a fan motion. Leave enough space so when they come out of the oven you can put a lollipop stick in them. Stick in oven for about 5-6 minutes. Keep a close eye on them and take them out when they are melted into the desired shape. Immediately roll the end of a lollipop stick in each sucker towards the bottom. 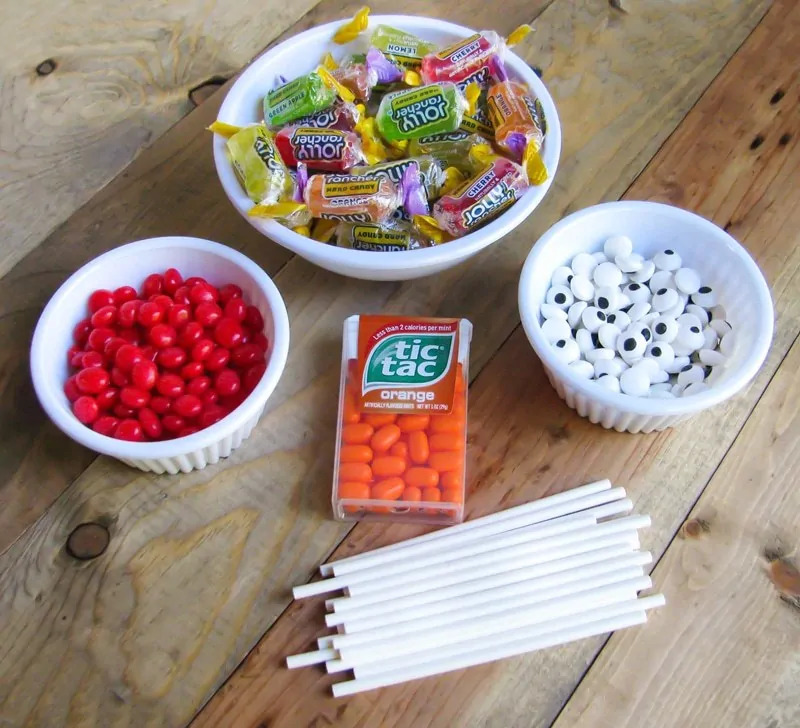 Quickly add the candy eyes, Tic-Tacs and Red Hot candies. If suckers start to harden, grab a lighter. Carefully, hold the flame for a few seconds where you want the candies to go. The flame will melt the sucker just enough so that you can stick the candies on. Let them set at room temperature until harden, about 10 minutes. Wow, what a creative and fun idea! 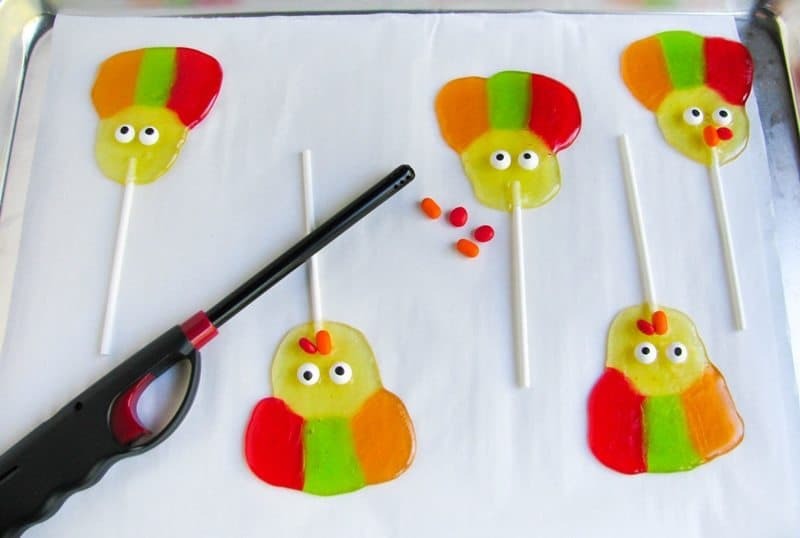 I would never have thought of melting candy down to make something else, how cool! 🙂 I will definitely have to try this with my oldest daughter, thanks for sharing! 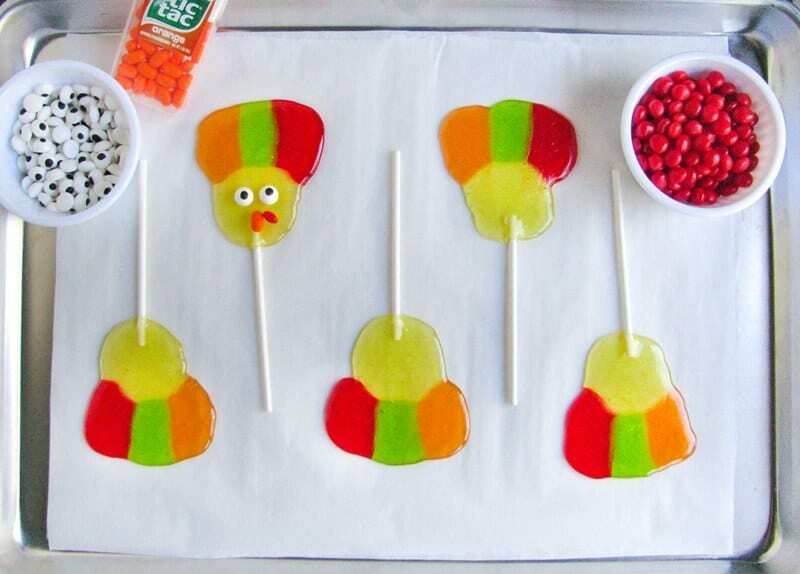 These are creative , cute and rather easy to make. Thanks for the recipe. These are so cute and with Halloween just being over we have plenty of candy. My grandchildren are just going to love them. 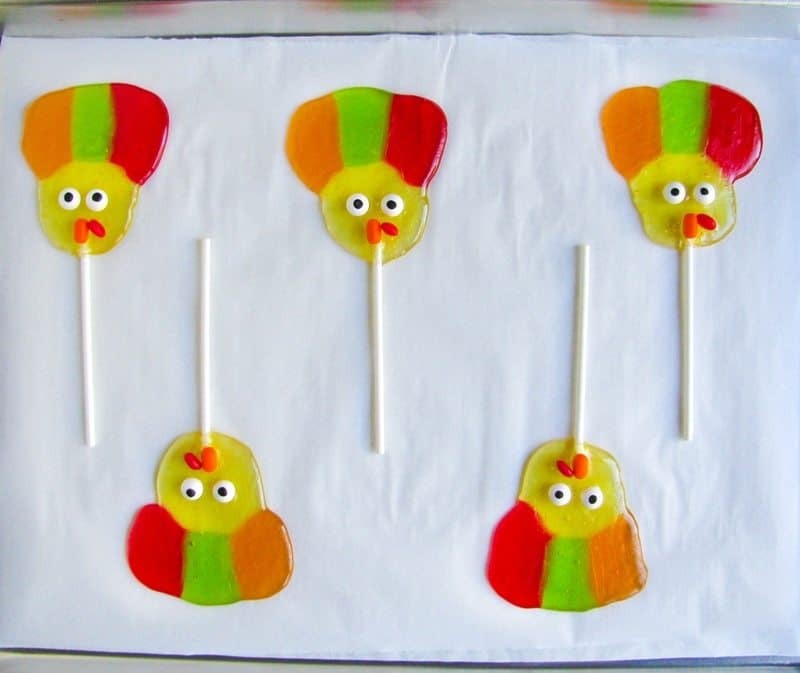 Cute and easy to make. A great combination. You do the cutest things with Jolly Ranchers. Can’t wait to see what you will do with them next month. These are just too cute I can’t wait to make these with my grand daughter. 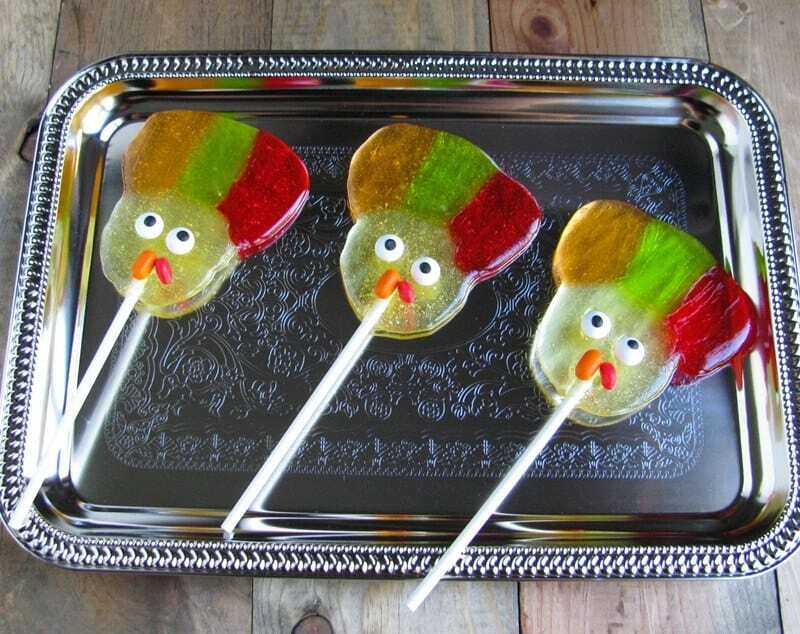 Thank you so much for sharing this cute holiday treat which I am sure will become a Thanksgiving Tradition at my house. These are so cute. Kids would love these. I think I’ll have my daughter make these with my niece! This is such a cute idea and what a great way to lick up on some jolly ranchers.